Mobile Boat Hoist Manufacturer Supplies Light Duty Travel Lift Heavy Duty Travel Lift With Low Price Reliable Performance Great Choice For Boat Lifting! Mobile boat hoist is kind of gantry crane. It can be used on land for transporting, maintaining vessel and lifting other material with long seize, it is also applied for lifting vessel from water or putting vessel into water. 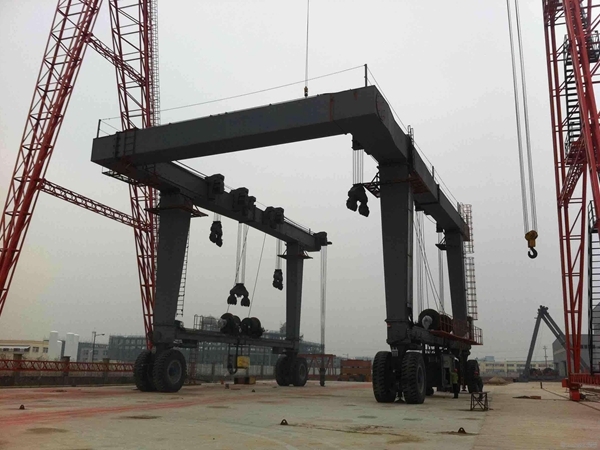 Compared with common gantry cranes, boat hoist for sale has following differences, soft and firm belts, many lifting points, rubber tyred wheels, U shape design. With these features, boat hoist is amphibious. It can be used for land construction and water sport meetings, aquatic clubs, voyages, ports. Ellsen, a professional boat hoists manufacturer in China, provides cost-effective marine vessel hoist gantry crane for sale, such as remote control travel lift, cabin control marine boat joist, rubber tyre mobile travel lift boat hoist, light duty and heavy duty travel lift! 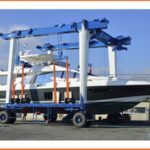 For better price travel lifts, just choose Ellsen marine boat hoist! Overload protection can avoid overload, the hoist device switches off, only the lowering motion is possible. Long travel limiter and cross travel limiter adopts preliminary and final limit switches or wireless anti-collision device. Anti-falling protection device is mainly used for the three-in-one electric motor of trolley and crane. All movements can be controlled by actuating the emergency-off switch at the control station. Polyurethane material buffer is installed to prevent over traveling. Safety hook latch is used for avoiding the lifted material out off from the hook. Audible and visual alarm device can inform the person who stays near by the travelling crane. Rain cover for lifting mechanism is designed for outdoor cranes, electric cabinet and driving mechanism. Protective earth conductor is fitted as standards. Voltage lower protection system can prevent voltage lower than standard. Current overload protection system can ensure current in normal condition.